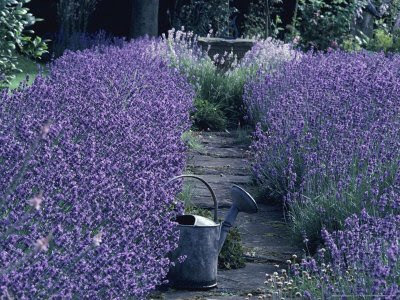 When should you cut back your lavender plants? Not sure? Well, get it wrong and you risk leaving your plants a weak and sorry-looking bag of sticks. Get it right and next year your plants will be vigorous and full of soft, succulent, and healthy growth. Make sure you get it right by pruning your lavender plants back in August. Why August? Because August is the hottest month of the year - at least is is where I live. And the reason why this is important is because the plant will be naturally dormant during this time, but ready of a second season's flush of growth during the oncoming autumn. Of course if you don't live in a European climate and August is not the hottest month of your year then I am sure you will know which one it is for your location and therefore prune back in that month. You prune English lavender Lavandula angustifolia by cutting it back by two thirds of its overall height, you can even cut into the bare wood, if needed. New shoots will quickly appear at the base of the bush and these will have enough time to grow and harden up before winter comes. This pruning regime will keep an English lavender plant compact for many years and a well-pruned plant can last for twenty years or more without becoming woody. You can give English lavender another tidy in April to delay flowering time. This is particularly useful close to roses, because the main flush of lavender follows the June flush of roses. With less hardy lavender varieties you never cut back hard into the bare wood. Shape them with shears in late August, aiming for a rounded mound of foliage. Lavender stoechas varieties have a flag-like petals at the top of each thick flower spike and they are often labelled Spanish or French lavenders. They flower in much earlier, often in May, but are much less hardy than most garden lavenders. Give them a very gentle trim after the first flush of flowers has faded, often in late June, but never cut them back hard as this can kill them off.